Cynthia Law (senior) went 4-1 to take 3rd place at the Queen of the Mat tournament with four dominant wins by pin. 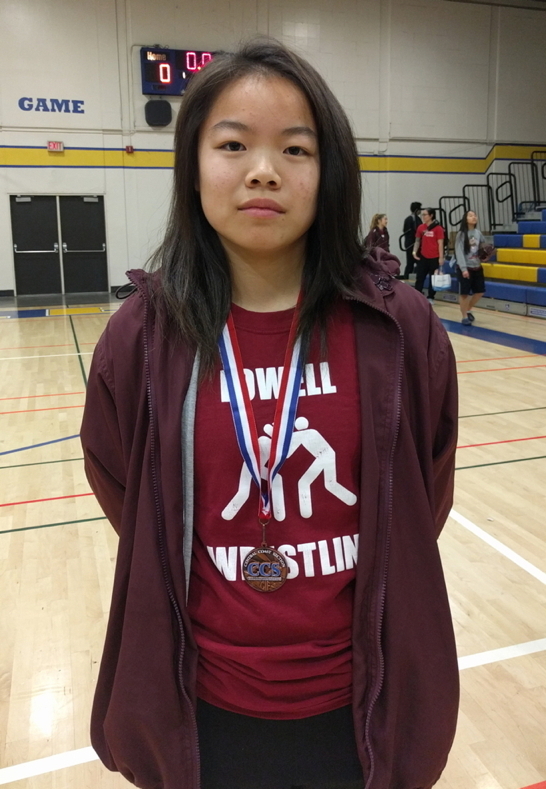 Lowell sent its lone female wrestler, Cynthia Law (senior) , to the Queen of the Mat tournament at Pittsburg HS on Saturday, Jan. 4. 25 schools competed in the tournament. Cynthia competed unseeded in the 121 lb weight class. She lost her first match to the #1 seed and eventual tournament champion. However, in a remarkable performance, she fought back in consolation to win her next four matches in a row and placing 3rd. Notably, she won all four matches by pin. This entry was posted in Announcements and tagged 2013-14 Season, Girls on January 5, 2014 by coachwise. Alondra Barajas (senior) takes 2nd place in the 126 lb. weight class at the 2013 Central Coast Section (CCS) Girls Wrestling Championships held at Oak Grove HS in San Jose on Feb. 1-2. 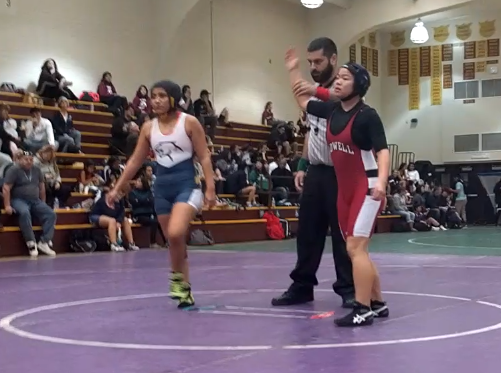 On Feb. 1-2, seventy-five high schools from King City 150 miles away, to Salinas, to San Jose, to San Francisco and all points in between sent their female wrestlers to the Central Coast Section championships. After two days of hard wrestling from 75 schools, Lowell senior Alondra Barajas emerged second place in the 126 lb weight class. This was preceded by dominant performances in her quarter-final and semi-final matches. This is Alondra’s highest CCS finish and third time qualifying for the state championships. 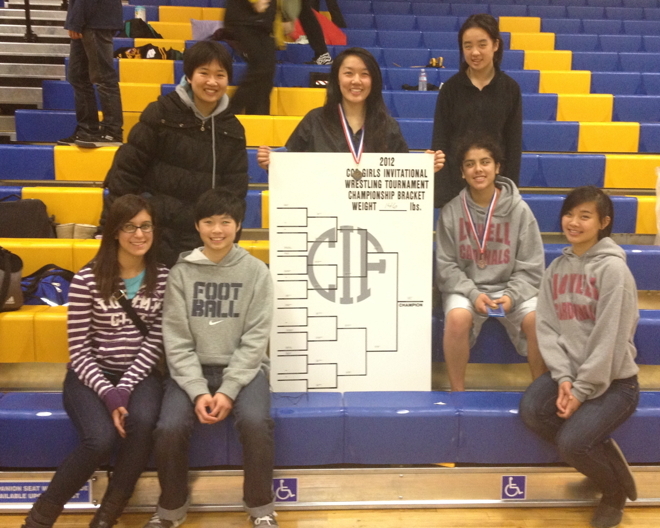 Alondra will next be competing in the 2013 CIF State Championships at Lemoore HS Feb. 22-23. If you know Alondra or see her, please congratulate her on her continued excellence in the sport of wrestling. The Lowell community and the San Francisco section wishes her well at the state championships. This entry was posted in Announcements and tagged 2012-13 Season, Girls on February 3, 2013 by coachwise. Lowell put on a spectacular performance not only representing Lowell and San Francisco well but also demonstrating they can compete with the best wrestlers CCS has to offer. 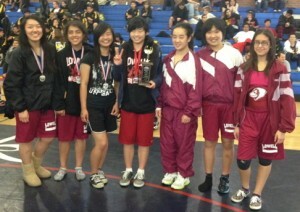 Three Lowell girls placed, two medaled and go to state, and the team placed 7th at 2012 CCS girls wrestling championships. 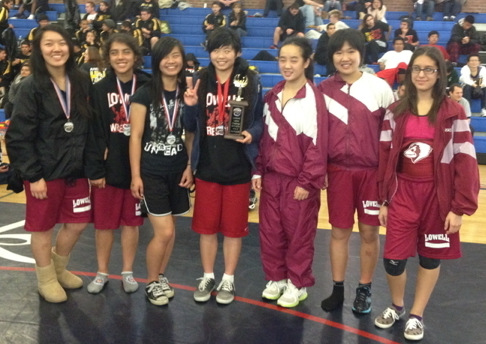 After four months of hard workouts, tournaments, and dual-meet competitions Lowell sent seven girls to the 2012 Central Coast Section (CCS) girls wrestling championships at Oak Grove HS in San Jose Feb. 3-4. Because the SF section is so small, CIF requires that all SF section girls compete at the CCS championships in order to qualify for the state championships…with the top four finishers in each weight class qualifying to compete in the state championships at Lemoore HS Feb. 24-25. The CCS area covers all California central coastal area high schools from Daly city to the north to as far as Salinas to the south. The Lowell girls with only half a roster still placed 7th out of 47 schools participating. All our girls contributed to that strong team finish by getting wins over two days of wrestling with 32 wrestled. 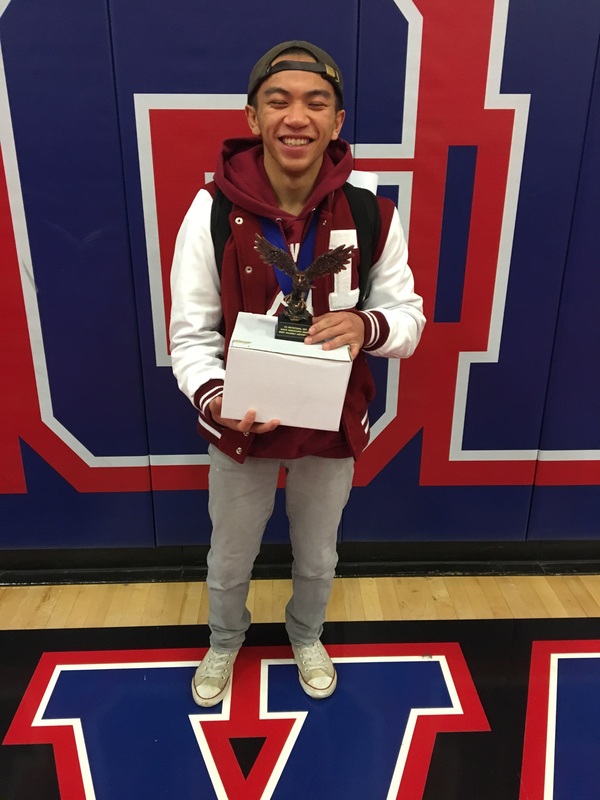 Senior, Ivy Ouyang (team captain) took first place at 146 lbs. Ivy wrestled very well throughout the tournament displaying great scrambling skills, technique, and tactical awareness. She capped it off in the championship match with a come from behind win with 40 seconds left in the match. Ivy will advance to the state championships. Junior, Alondra Barajas took 4th place at 132 lbs. 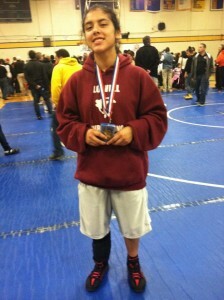 Alondra also wrestled very well throughout the tournament. She had some very tough matches, but she stuck with her physically aggressive style of wrestling and pulled off hard-fought wins to place 4th and qualify for the state championships. Sophomore, Theresa Zhao, a first year wrestler, took 6th place. Also competing and getting numerous wins to help Lowell place so well were: sophomore, Jenelle Lai at 108 lbs. ; sophomore, Cynthia Law at 114 lbs. ; sophomore, Maggie Medina at 118 lbs. ; and freshman, Jane Zhao at 122 lbs. If you see these girls at school please take a moment to congratulate them on their outstanding team and individual performances. They represent the best of what it means to be a student-athlete: strong academic performance; good sportsmanship; hard work ethic ; team discipline; attending and working hard at practice every day; and performing to the best of their abilities in competitions. The Lowell wrestling coaches are very proud of them, and the Lowell community should be too! This entry was posted in Announcements and tagged 2011-12 Season, Girls on February 5, 2012 by coachwise. 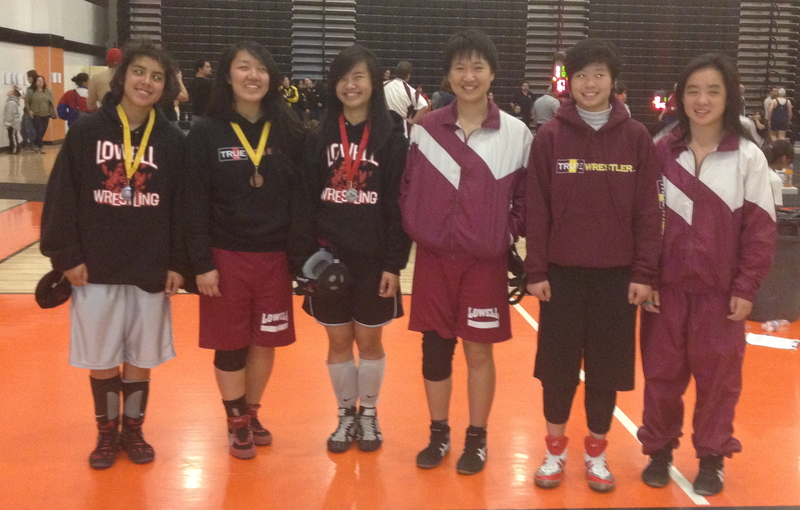 Lowell sent six girl wrestlers to the Queen of the Mat girls wrestling tournament at Pittsburg HS on Jan. 7. This was a sizable tournament with 31 teams from mostly North Coast and Central Coast Section schools and a good performance barometer for our girls as they prepare for the CCS state championships qualifier on Feb. 3. Our girls wrestled very well having some very tough matches going 17-9. Sophomore Cynthia Law took 2nd place at 118 lbs. Senior Ivy Ouyang (team captain) took 3rd place at 152 lbs. Sophomore Alondra Barajas took 3rd place at 132 lbs. Sophomore Jenelle Lai took 5th place at 113 lbs. Sophomore Theresa Zhao took 5th place at 146 lbs. This entry was posted in Announcements and tagged 2011-12 Season, Girls on January 8, 2012 by coachwise. 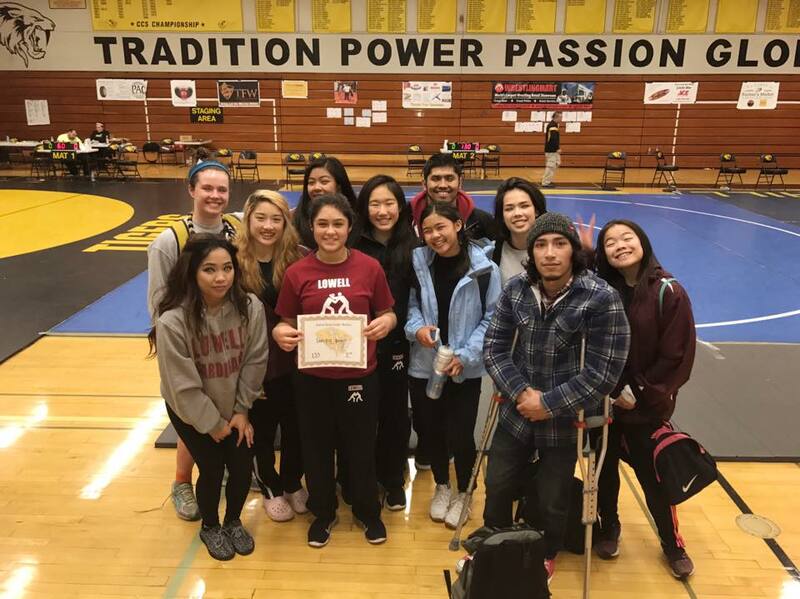 Led by senior Ivy Ouyang (tournament champion), the Lowell varsity girls wrestling team placed second at the Lynbrook Ladies Challenge at Lynbrook HS in San Jose on Saturday, Dec. 17. Despite sending only half a girls team (seven girls), the Lowell girls varsity wrestling team still powered through for a second place team score behind strong performances by all our girls. Ivy Ouyang (senior) – 1st place at 146 lbs. Ivy pinned every opponent she faced in the first period capped by a stunning 38 second pin in the championship match. Alondra Barajas (junior) – 2nd place at 132 lbs. Alondra physically dominated her opponents, but had a very tough championship match against the reigning CCS champion. Cynthia Law (sophomore) – 2nd place at 123 lbs. Cynthia weighed in for the 118 lbs. weight class, but the tournament put her in the 123 lbs. weight class. Still she managed to beat all the bigger girls she wrestled accept for the tournament champion. Jenelle Lai (sophomore) – 3rd place at 114 lbs. Jenelle also had only one loss in a close match. She pinned or majored everybody else she wrestled. Theresa Zhao (sophomore) – 4th place at 146 lbs. Theresa is a first year wrestler but wrestled well. Also competing and getting wins for Lowell were first year wrestlers Maggie Medina (sophomore) at 114 lbs and Jane Zhao (freshman) at 132 lbs. Although there were many impressive individual performances by the Lowell girls the second place finish with only half a team was a team effort and the direct result of hard conditioning and wrestling and lots of drill in the practice room. Hard work always pays off: our girls are proof of that. This entry was posted in Announcements and tagged 2011-12 Season, Girls on December 18, 2011 by coachwise.